Gandharva grahonmada (GG) is one among 18 types of bhootonmada or grahonmada. Bhootonmada comprises a vast category of psychiatric problems which are assumed to be caused by affliction of evil spirits or super natural powers or extra terrestrial forces or idiopathic factors. The present study aims at better understanding of GG and its clinical applicability to the present day psychiatry practice. GG is characterized by Chandam/Teekshnam (anger/aggressiveness/irritability/hostility/violence), Saahasikam (risk taking behaviour/agitation/increased psychomotor activity), Gambheera and Adhrushya (grandiosity /agitation), Nrutyantam, gaayantam, mukha vaadyaani kurvantam (dancing, singing and playing music), Pulina vanaantaropasevi, hrishtaatma, prahasati, haasya kathaanuyogam (engaged in pleasurable activities/euphoria), Snaana, maalya, anulepana, dhoopa, gandha ratim (flamboyant appearance / obsessive compulsive symptoms), Shringaara leelaabhiratim (hyper sexuality), Rakta vastram (wearing red colour garments), Paana ratim (alcohol abuse), Svaachaaram (virtuous conduct), Chaaru chaalpa shabdam and alpa vyavahaaram (hypomania/mixed episode/mania with depressive symptoms) etc features. These features of GG show similarity with mania or hypomania or bipolar disorder (BD) comorbid with obsessive compulsive disorder (OCD). Samrambha grahonmada and hasana grahonmada are two subtypes of GG which also resembles with mania. 'Samrambha grahonmada' resembles with 'irritable/aggressive mania' whereas 'hasana grahonmada' denotes 'grandiose / elated mania'. Background: Sinusitis is an inflammatory disorder of the nasal sinuses. Most of the persons who suffer from sinusitis very often do not get substantially relieved by the medical treatment available at present. Holistic approach of yoga has the potentiality to prevent and cure the sinusitis condition. Materials and Methods: The Indian concept of Sinusitis in general and Yogic Concept of Sinusitis in specific has been explained. Present paper describes the yogic concepts which can be adopted for the management of Sinusitis condition. 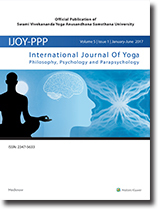 Conclusion: Yoga can increase the resistance against the infection of sinuses and holistic approach of yoga has the potentiality to prevent and cure the sinusitis condition. By adopting the yogic techniques properly, the impurities of the sinuses can be removed and further stagnation can be prevented. Objective: To evaluate immediate effect of Nadisodhana Pranayama on state anxiety in patients suffering with anxiety disorder. Materials and Methods: The study was performed on psychiatric participants (male = 10; female = 12) with age range of 18 to 49 years, age mean ± standard deviation (30.22 ± 09.08). The baseline data were used. The self as control design was followed participants participated in Nadisodhana and Breath awareness for 10 min. the same time for two consecutive days. The sequence of the session was assigned randomly to the participants. The state anxiety was assessed using state-trait anxiety inventory (STAI) before and immediately after each session. 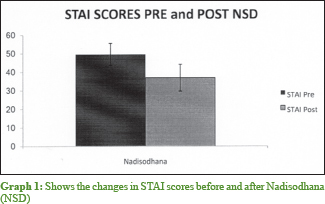 Results: Within-group comparison showed that due to alternate nostril breathing and breath awareness, STAI scores reduced or significant reduction of STAI scores in both groups (P < 0.001). In between-group comparison baseline was statistically matched (P = 0.596) whereas after intervention there was significant difference in STAI scores (P < 0.001; Mann–Whitney test). The percentage change of state anxiety was 25% after Nadisodhana whereas 8% after breath awareness. Conclusion: This pilot study shows that both Nadisodhana and breath awareness are effective mind-body practices to reduce state anxiety in patients suffering from anxiety neurosis. However, the immediate effect in reducing state anxiety was better after Nadisodhana (25%) compared to breath awareness (8%).